Dean Young at The Marine Group tells me he and Stuart Larsen at Fraser Yachts have sold the 46.02m motor yacht Elle, with Liberty Yacht bringing the buyer. 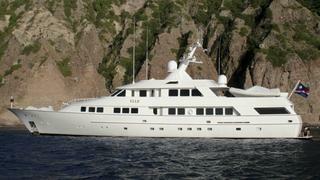 Elle was built at the USA’s Puglia yard in Tacoma in 1993 to a design by the late Gerhard Gilgenast. Refitted in 2008 and ABS classed, this superyacht sleeps 10 guests in five staterooms and twin 800hp Caterpillar engines give her a range of 8,000 nautical miles. Elle was asking $10.9 million.